Shoppers who judge the freshness of meat by its pink color may be deceived by a relatively new industry practice of treating meat with carbon monoxide, critics say. The meat industry defends the use of carbon monoxide to help meat retain its pink hue, saying large sums of money are wasted when sellers throw away meat that is still safe to eat but is not as attractive because it is slightly brown. "Color is the number one indicator that's used" in selecting meat, said Don Berdahl, vice president of Kalsec Inc., a maker of natural food extracts in Kalamazoo, Mich. Last November Kalsec filed a petition with the Food and Drug Administration seeking a ban on the use of carbon monoxide in meat packaging. Berdahl said Tuesday that carbon monoxide-treated meat could be left on the kitchen counter for five days and would still look bright red and fresh. 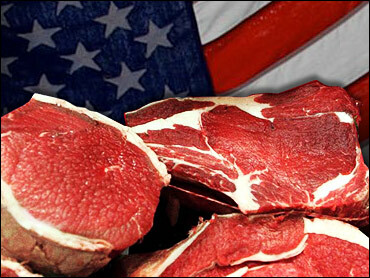 The petition said treated meat could hide the growth of pathogens such as Clostridium botulinum, Salmonella and E. coli. "The meat industry is taking away one of the key visual cues that consumers use to determine whether meat is fresh or whether it's old and may be spoiled," asserted Caroline DeWaal, Food Safety Director of the Center for Science and Public Interest, on The Early Show Tuesday. "It locks in the redness. That means that meat that could be old and spoiled will still look fresh in the package." Berdahl acknowledged that his company has a business interest in protesting the practice. But consumer groups, while agreeing that carbon monoxide in itself is not a health risk, are concerned that meat buyers will focus on the color and ignore expiration dates and other signs that meat is no longer edible. "Carbon monoxide masks the natural coloration of meat by reacting with myoglobin in the meat and producing a bright red color," the Consumer Federation of America and the group Safe Tables Our Priority wrote last month in asking the FDA to reverse its acceptance of the practice. The artificial color, they said, "has been found to last 'beyond the time of spoilage,' thus masking the true color and freshness of meat packaged with carbon monoxide." The Kalsec petition also argued that the FDA does not have the legal authority to permit the use of carbon monoxide in fresh meat packaging because it is an unapproved and prohibited color additive. Carbon monoxide is used in some "case-ready" meats, products put in leak-proof, tamperproof, hermetically sealed packages before being shipped to the local butcher or supermarket. Up to 60 percent of meat sold is now case-ready, according to industry estimates, but a relatively small amount of that is carbon monoxide-treated, said Dr. Randall Huffman, vice president for scientific affairs at the American Meat Institute. In most cases, he said, case-ready meat is treated with a high level of oxygen, which causes the meat to turn red but also leads to deterioration of color, quality and flavor. The carbon monoxide technology eliminates the oxygen, preventing degradations in quality, he said. "It eliminates so much waste in the system," Huffman said. "It's an excellent way to reduce costs and keep meat prices competitive for consumers." Since 2002, the FDA has given the go-ahead to three meat producing or packaging firms to use carbon monoxide under a process known as "generally recognized as safe," or GRAS. Under GRAS notifications, the FDA conducts no research on its own, instead relying on the notifier's documents confirming the safety of the product. Dr. Laura Tarentino, director of the FDA office of food additive safety, said in a telephone interview that the FDA had reviewed the evidence submitted by companies seeking to use the procedure and "did not disagree" with conclusions that it was safe. She said the agency would be concerned "if we had evidence that consumers would be misled into buying meat that was spoiled." But so far, she said, there was "no evidence that that is the case." Critics of carbon monoxide usage also pointed to the 2003 decision by the European Union to ban the practice in meat and tuna. Canada, Japan and Singapore don't allow carbon monoxide treatment for tuna.